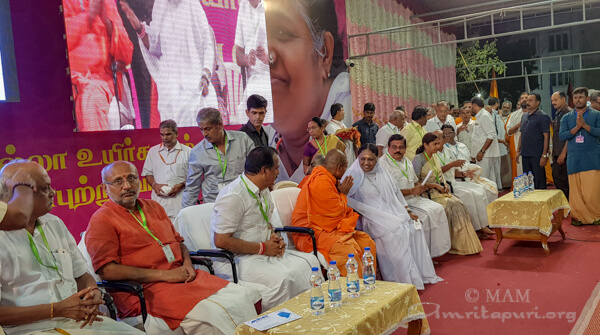 For the evening program, Mayor Pushpalatha Jagannath, Corporator Nirmala Harish, Savitha Suresh, Industrialist Jagannath Shenoy, and others were there on stage to welcome Amma to Mysore. 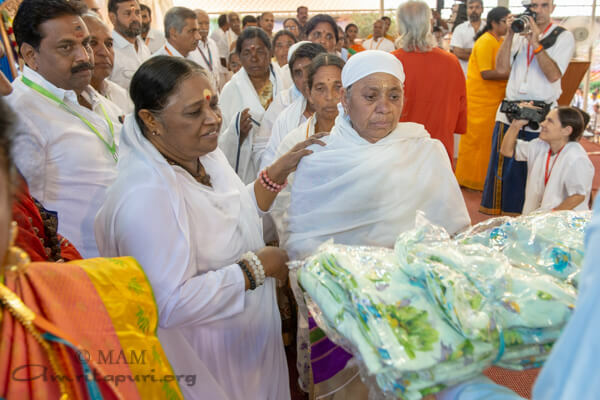 Amma gave away saris to AmritaSree self-help group members. 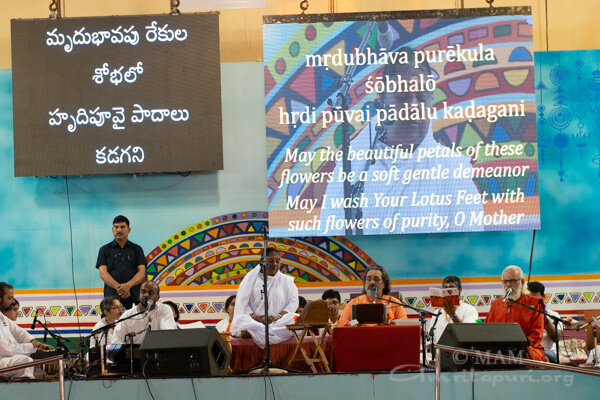 Amma then gave satsang and sang bhajans. 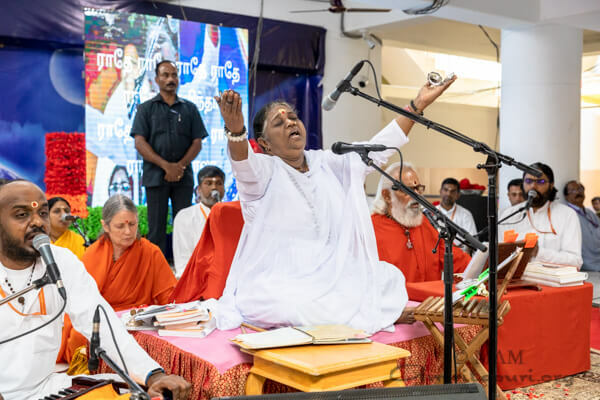 During her satsang, Amma said, “We should give the same importance to nature and culture as we give to science and technology, In just one second, Nature can take back what she has given to us. If we understand this, we will be humble towards nature. 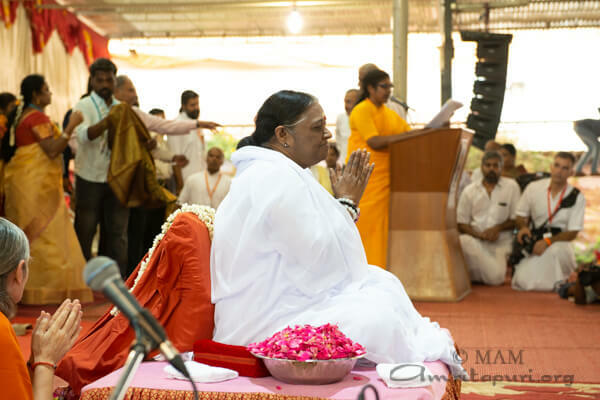 In each and every natural disaster, there is a message for us.” Amma then led all in manasa puja (mental worship) and meditation – giving instructions in Kannada, the local language. 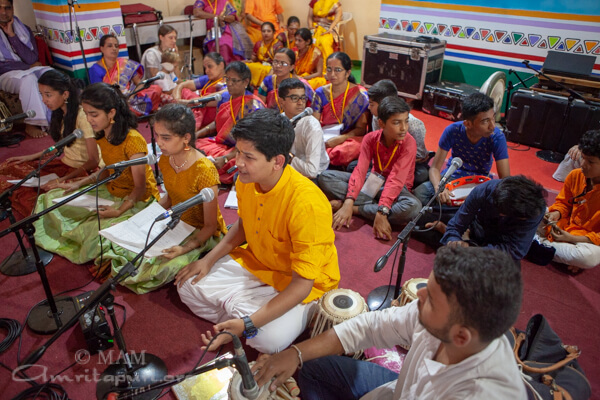 During darshan, Amrita Vidyalayam students and Students of Amrita Vishwa Vidya Peetham in Mysore presented different cultural programs. 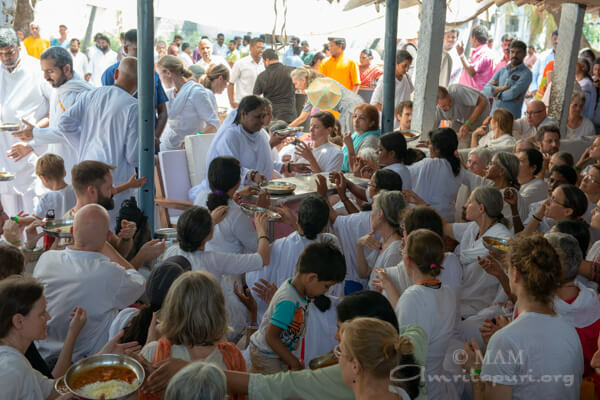 After leaving Amritapuri in the early morning hours for Mysore, Amma and the group stopped for lunch by a cowshed and farm fields in a village, Mopperipalayam in Tamil Nadu. 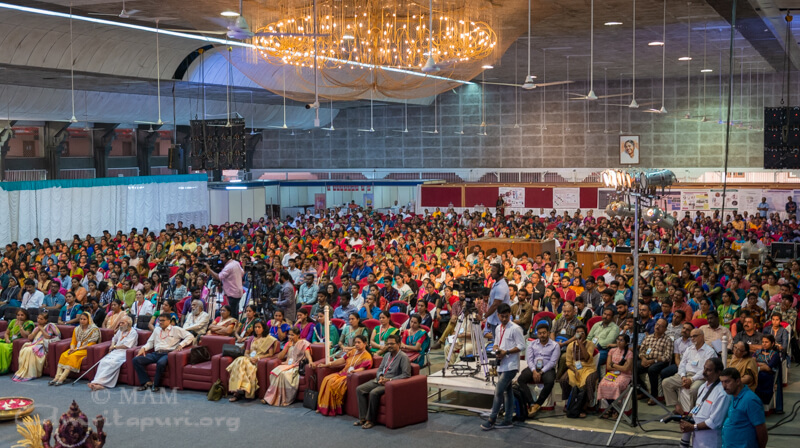 After serving the lunch to everyone, Amma spoke about the need of love to realize God. 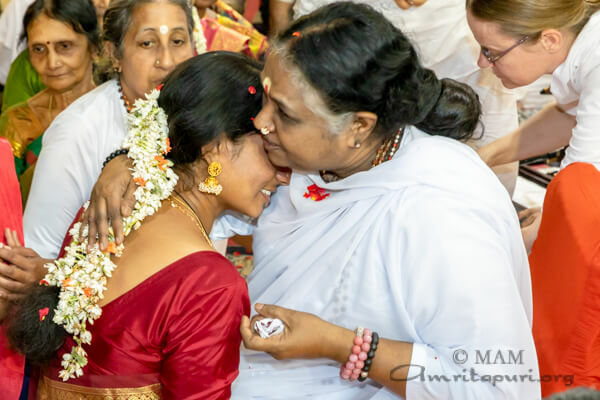 Amma said our intensity for realization should be compared to how much one would be grasping for breath if we were forcefully held under water. 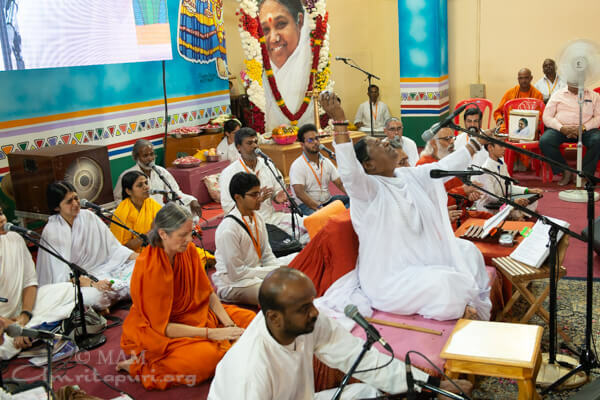 Amma then reminded everyone to chant our mantras and to imagine that our Ishta Devata (the favourite form of God we meditate upon) is traveling with us on the bus. 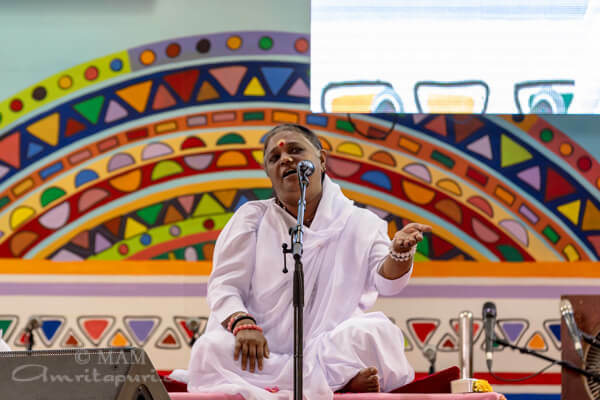 While looking at the sky, we should feel the vastness, and while looking at the beauty of nature, we should see our Ishta Devata in all these. 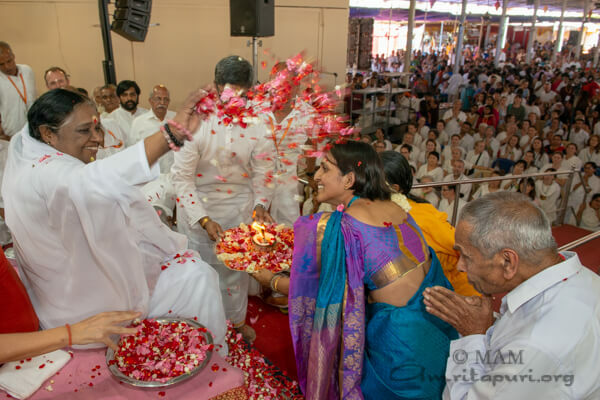 We should convert all action into a worship so that this Bharata Yatra is fruitful. 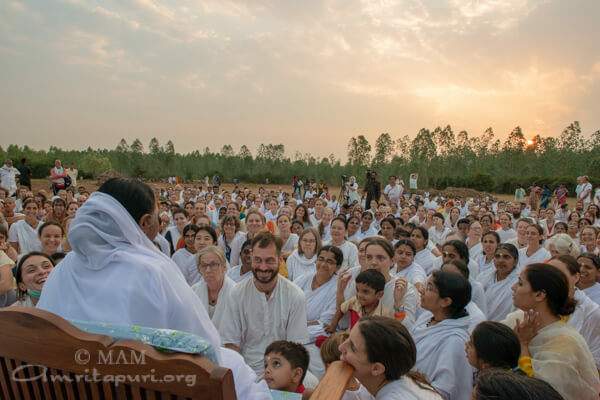 In the evening, Amma and the group stopped at the outskirts of a forest area near Chamraj Nagar, Karnataka. 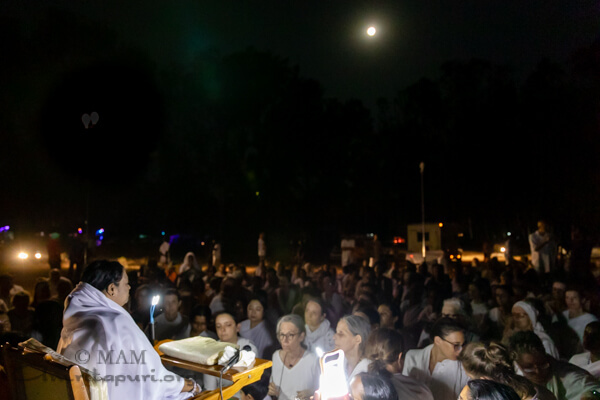 Sitting under the rising full moon, Amma gave Satsang, sang Bhajans, and led everyone in meditation. It was so beautiful. 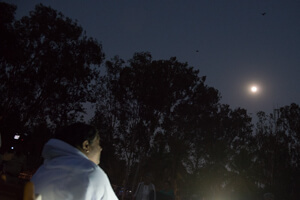 One could see many bats on top of the eucalyptus trees on the grounds. 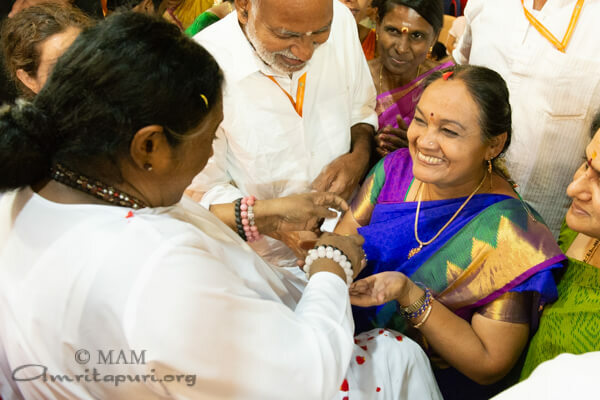 Amma told stories about her early life – how her father gave a small cow shed for her to use for darshan. 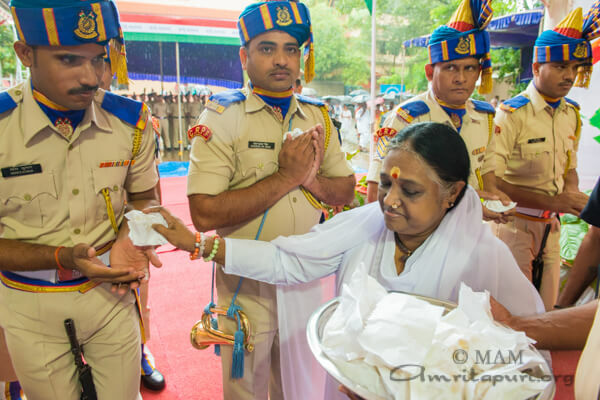 While giving darshan, Amma would put one hand on the cow. 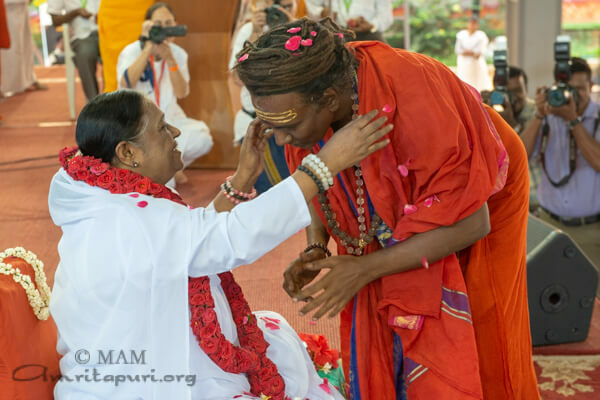 Amma also stayed and slept in the cowshed, and resting there she would kiss the cow and tell the cow stories. 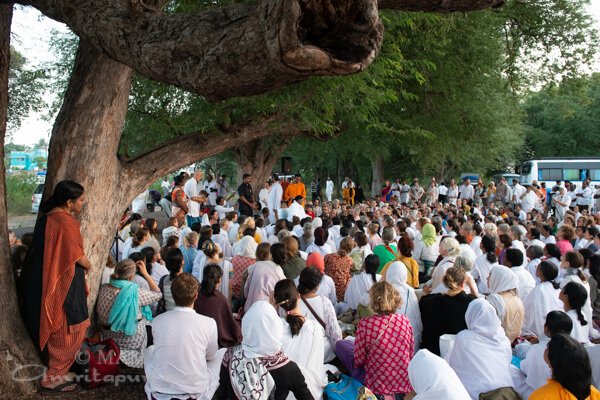 Amma explained how, in the past, people used to live as one with nature. After cleaning the courtyard, people would sprinkle the ground with cow dung mixed water or apply the cow dung as a paste on the floor . This was considered to be antiseptic. If you had an open wound, cow dung would be applied there. 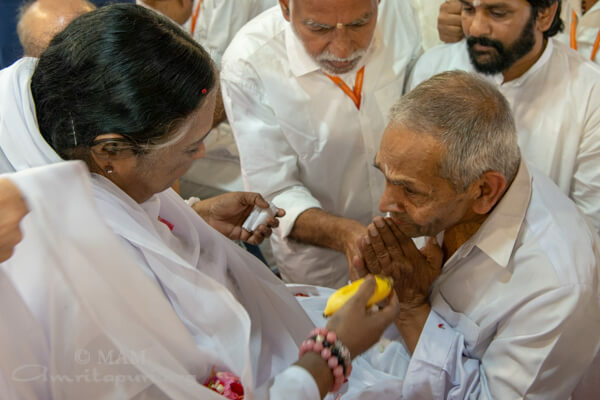 But today, it has become poison because the food, water, and air which the cow eats, drinks, and breathes has become contaminated and is toxic. Cow dung and urine have medicinal properties. 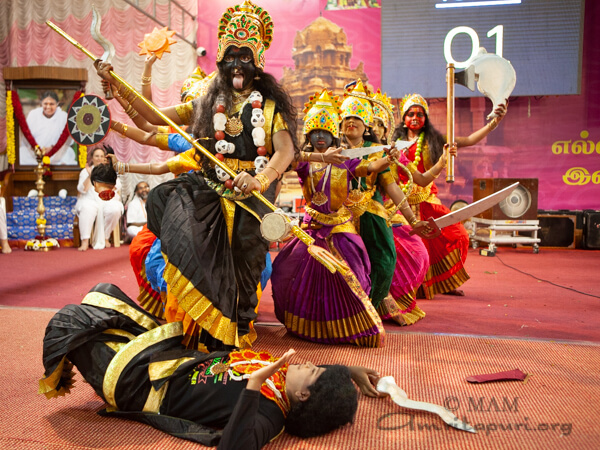 Sacred ash is made out of cow dung and has medicinal power. Cows also have the role of a guardian. The cow gives us more than what we give her. She feeds us with milk, and supports us throughout our life. Cows are used to plough the fields. Because of the cows’ help, man is able to live a better life. 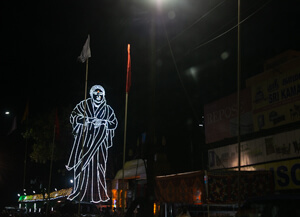 The cow is also connected with Krishna. The cow was his pet. 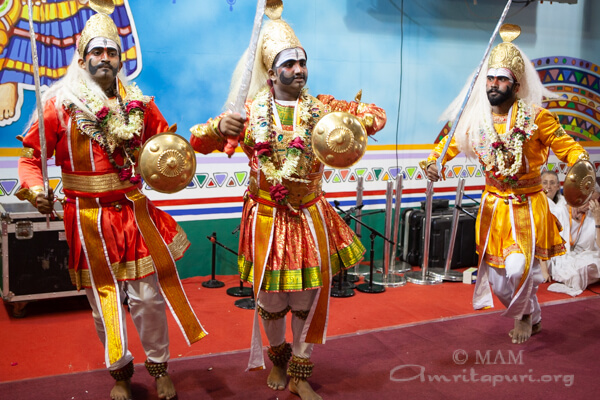 It was also Krishnas vehicle. 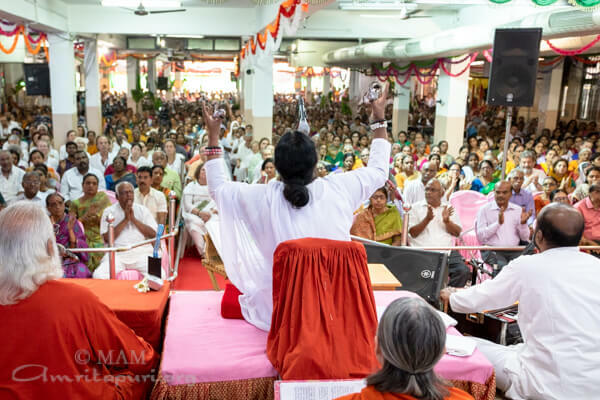 The cow has always held in a high place in Indian culture – that is why we are reluctant to slaughter cows and eat beef. We should feel grateful for the cow and we should feel that killing one is like killing your own father or mother. After bhajans, meditation and dinner with Amma under the moon light, the group proceed to Mysore. 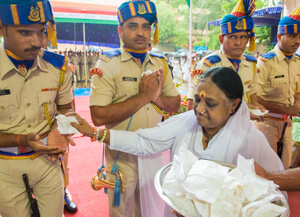 Amma will give ₹ five lakh ($7,000 U.S.) to the families of each of the 40+ Central Reserve Police Force (CRPF) soldiers killed in this week’s terror attack in Jammu-Kashmir’s Pulwama District. 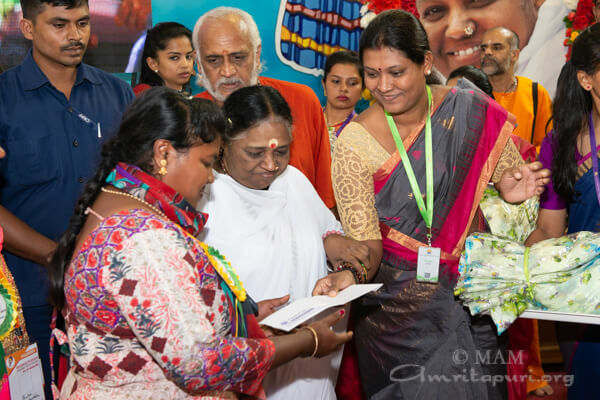 MAM volunteers will visit personally to each family of CRPF troopers martyred in Pulwama and hand over the cheque. 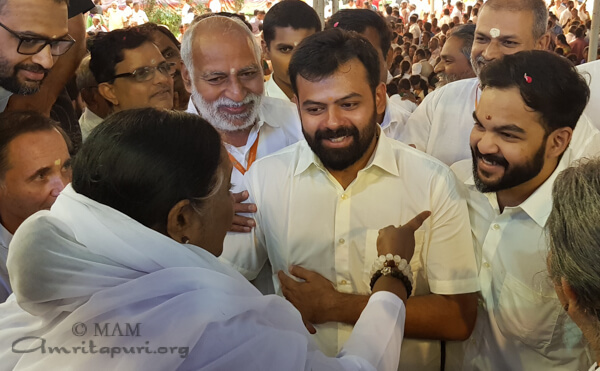 Amma announced the donation as she was travelling to Mysore, the first stop on the second leg of her 2019 Bharata Yatra. 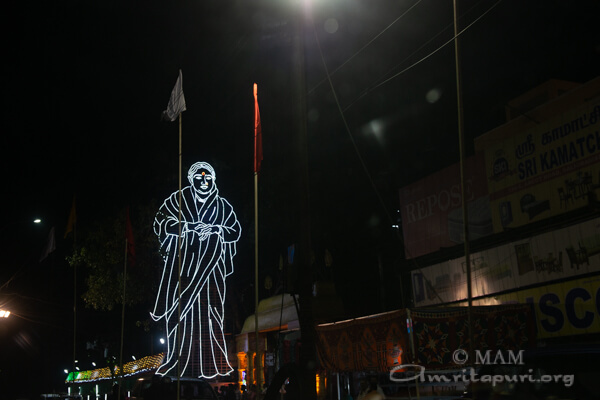 Amma held a two-day brahmasthanam festival in Coimbatore, Tamil Nadu. 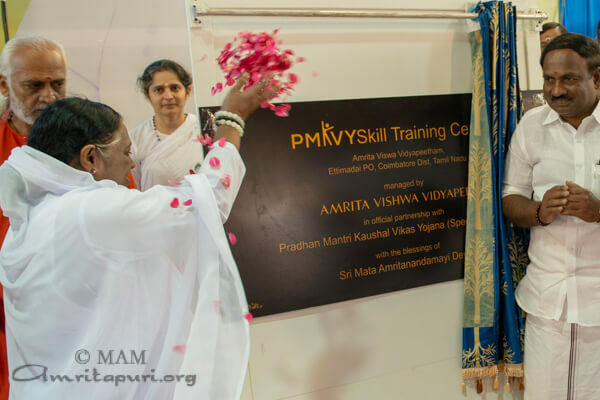 During the ceremonies, Amma inaugurated the Amrita PMKVY training program. PMKVY (Pradhan Mantri Kaushal Vikas Yojana) is an initiative undertaken by the Govt. of India designed to enable a large number of Indian youth to take up industry-relevant skill training that will help them in securing a better livelihood. 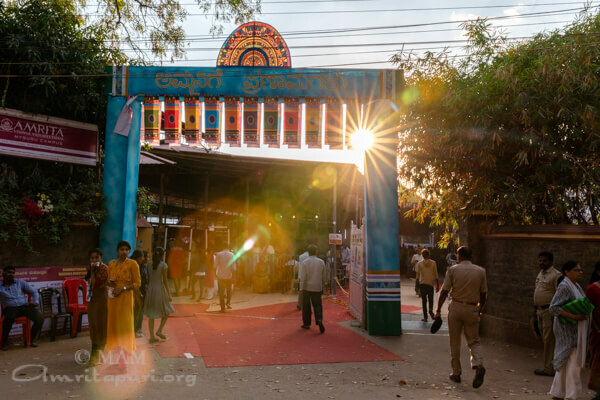 Amrita Vishwa Vidyapeetham in Coimbatore was selected by the Govt of India as an implementing agency for the program. The Coimbatore campus is the first Amrita PMKVY center in Tamil Nadu. 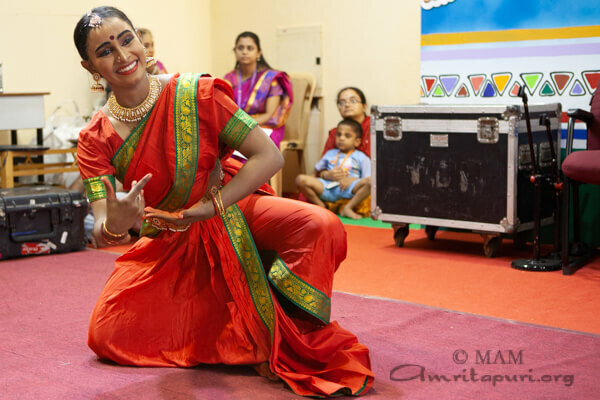 Amrita PMKVY offers an innovative technology-enabled training model that enhances the teaching and learning experience that allows for customization to the local context. Amrita has had an impressive track record in the skill training ecosystem. 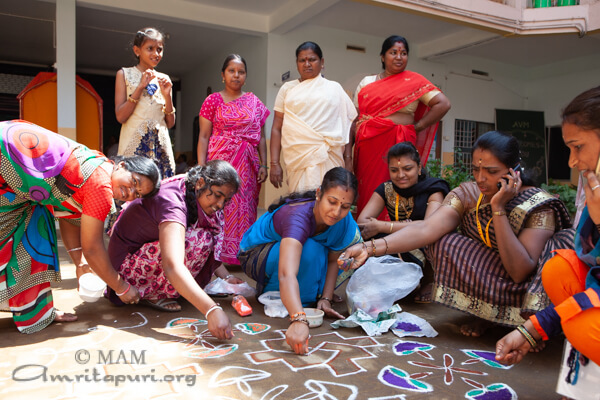 There are Over 2 lakh women engaged in self help groups, micro enterprises. Vocational training goes hand in hand with the women’s empowerment efforts in over 50 villages across 21 states in the country. 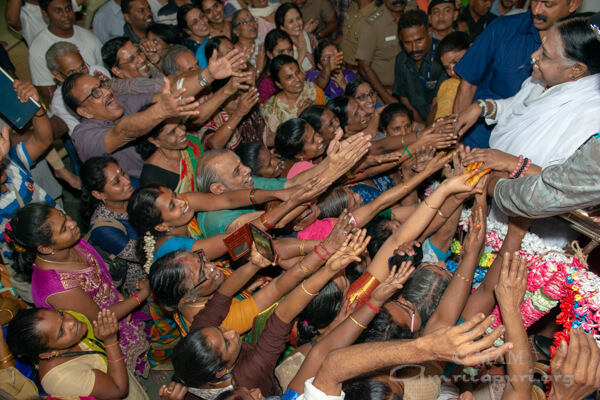 This year, this massive effort is set to expand to cover a 101 villages, across all 27 states. 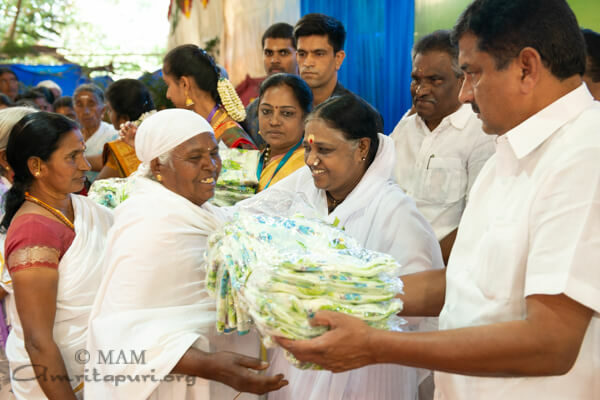 Amma also gave away saris to AmritaSREE Self-Help Group members. 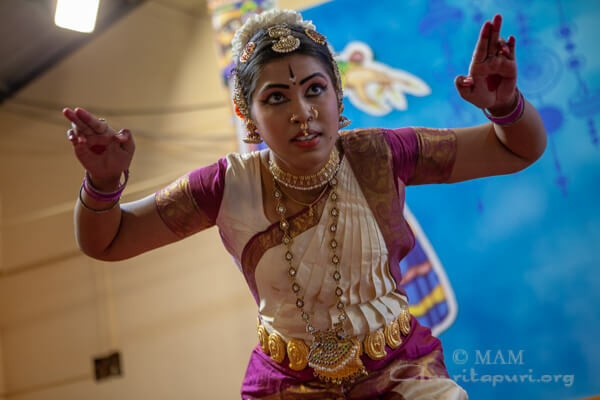 During darshan, Amrita Vidyalayam children presented a variety of cultural programs. 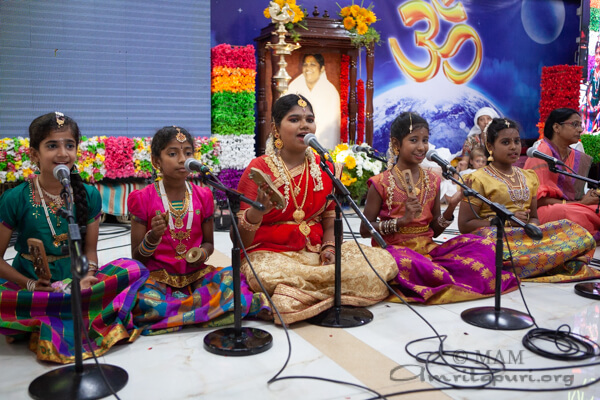 As in previous years, the Badugas sang and danced for Amma. 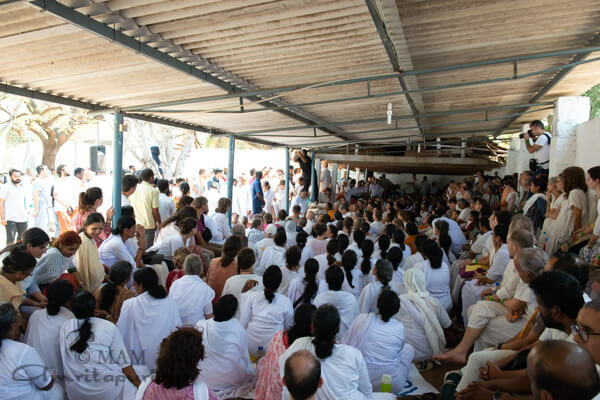 After two days of darshan, Amma headed back to Amritapuri. 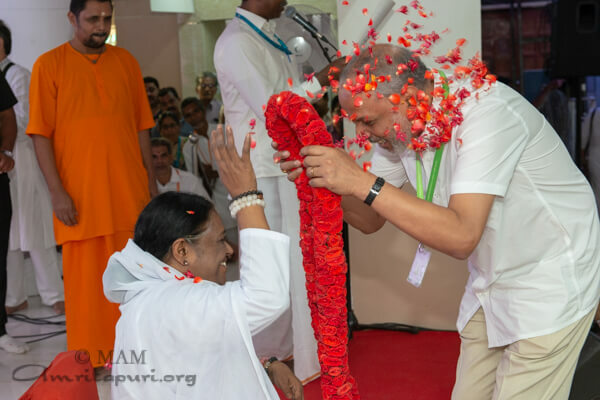 The first leg of this year’s Bharata Yatra had come to an end. 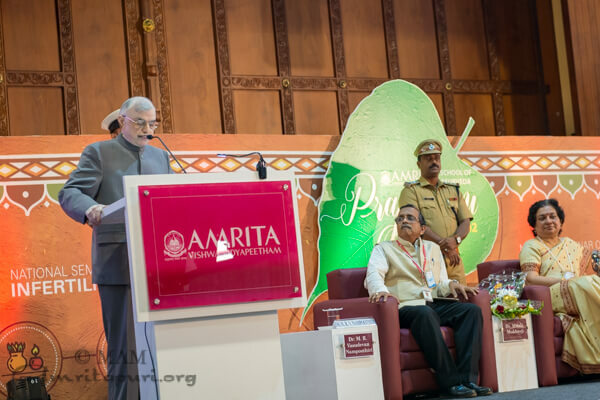 ‘Prajnanam’, a two-day national seminar on Ayurvedic solutions for infertility management was inaugurated today by Kerala Governor P. Sadasivam at Mata Amritanandamayi Math, Amritapuri, Kollam. 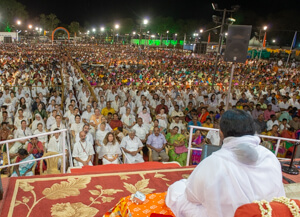 During his inaugural address, the Governor has observed that the nation lacks effective treatment for infertility in general and the situation called for the involvement of other medical disciplines including Ayurveda. 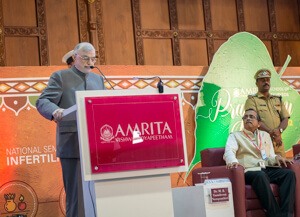 He emphasized the importance of having more clinical research activities in order to make Ayurveda the first choice for infertility management. 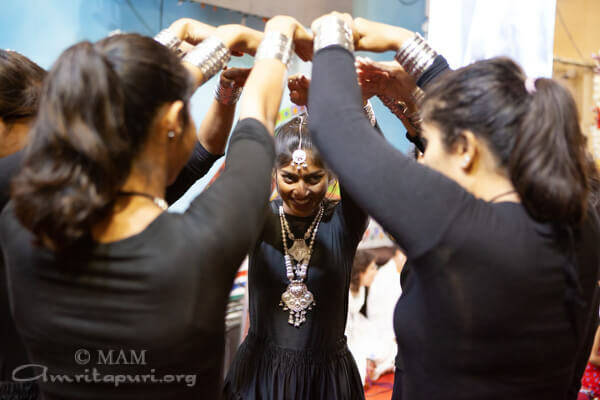 While analyzing the benefits of Ayurveda in comparison with other medical disciplines, he made a critical observation that only Ayurveda equips the body with better health before commencing the treatment for infertility. It is equally important to create infertility awareness along with treatment, he added. 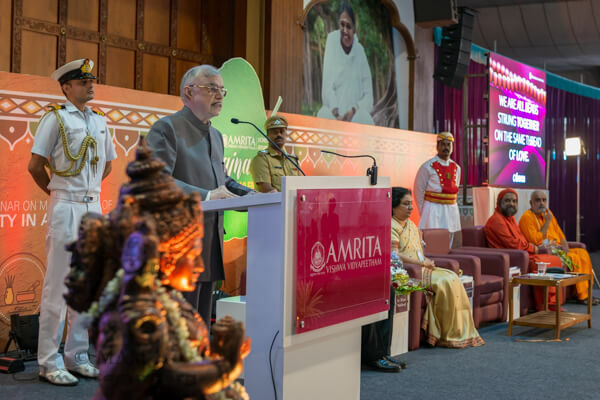 While concluding his speech, the governor has acclaimed the service of Amrita School of Ayurveda for its contribution in the field of research, including infertility management. 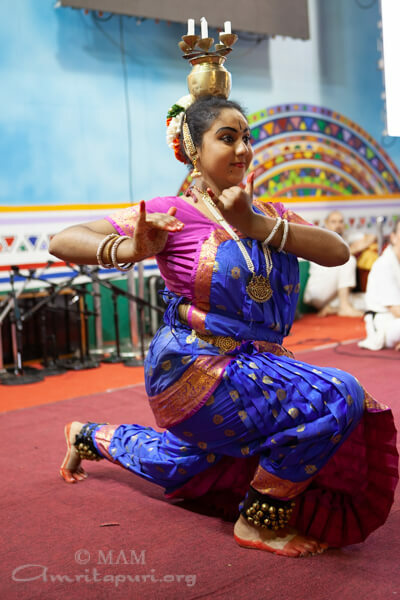 Prajnanam – the national seminar was organised by Amrita School of Ayurveda. 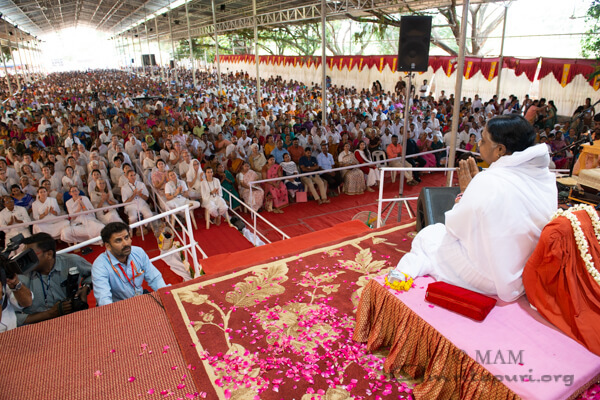 Around 1200 delegates representing 40 Ayurvedic institutions in 10 states took part in the two-day seminar. 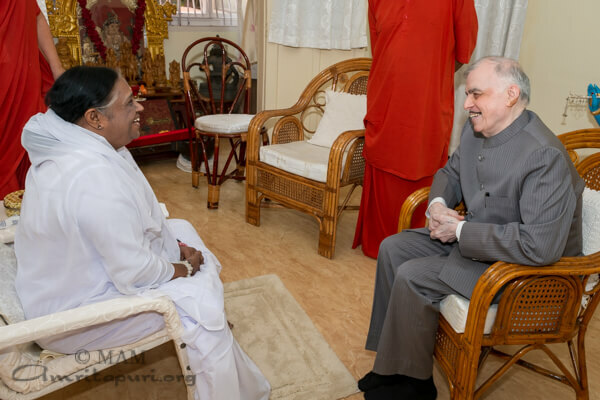 The Governor also had a private meeting with Amma. 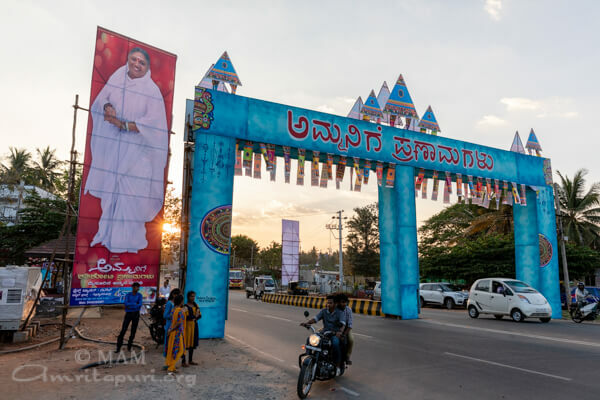 On the way to Tiruppur from Chennai, Amma stopped at a field just past the town of Ulundurpet. 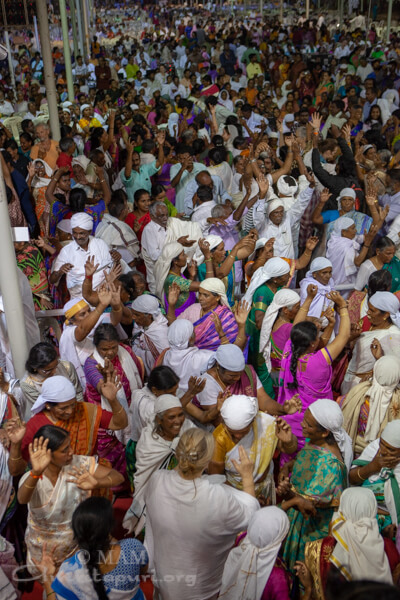 Amma led everyone in bhajans and meditation, gave satsang, and passed out prasad. 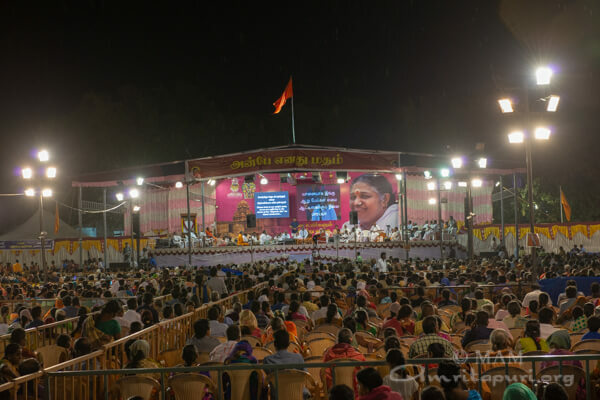 Amma’s program was held on the grounds of the Vivekanda Higher Secondary School in Tiruppur. This was Amma’s second visit to the city – the first was in 1997. 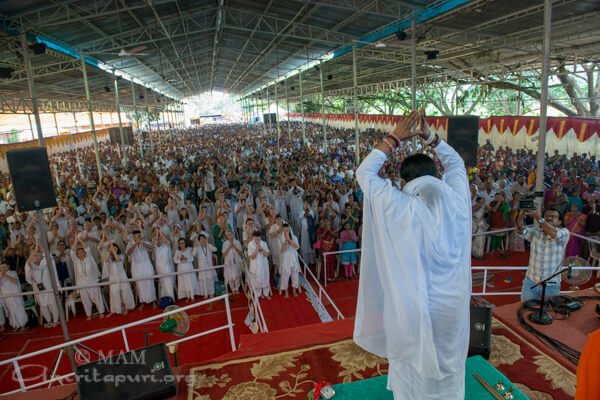 At that time, even though it rained during the program, crowds of people had waited for their turn for darshan. 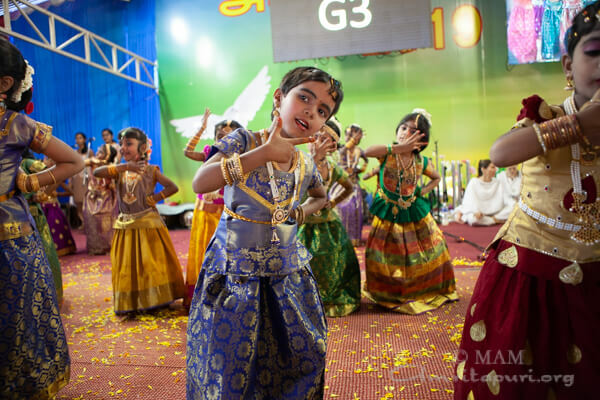 This year, it drizzled only during bhajans and the school grounds were overflowing with people. 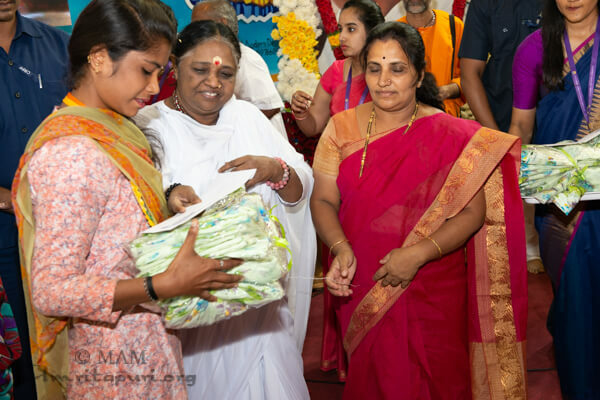 At the beginning of the program, Amma gave away saris to AmritaSREE Self-Help group members from the region. 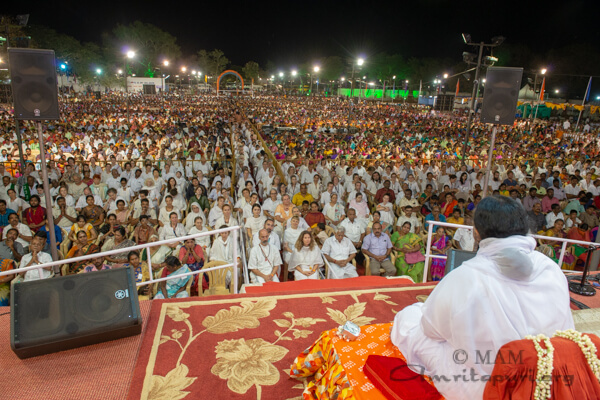 During Satsang, Amma said that human beings possessed infinite power and they could overcome any obstacle in life. She urged everyone to spread happiness throughout the world. 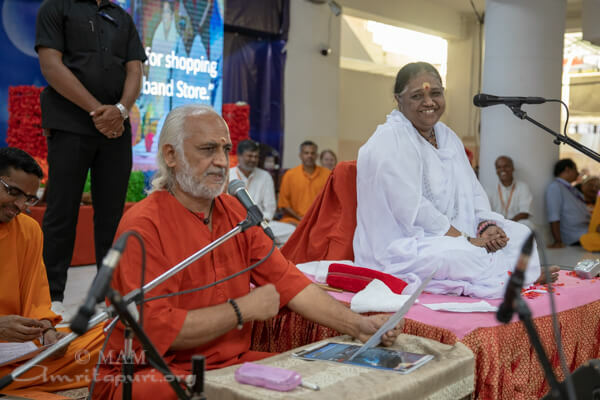 Citing the examples of a rainbow, flowers, the full moon, and a butterfly, Amma said that although their life span was short lived, they still spread happiness around. 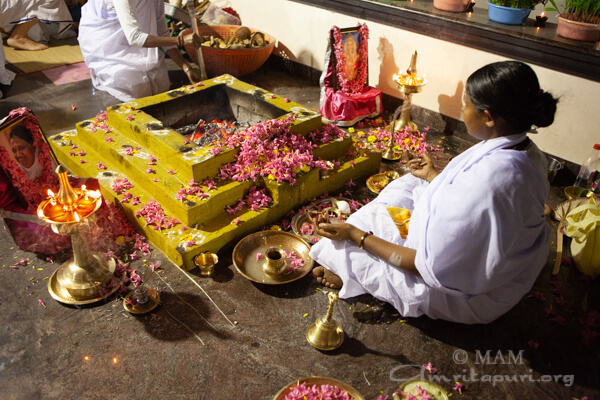 After bhajans, Amma led everyone in manasa puja. 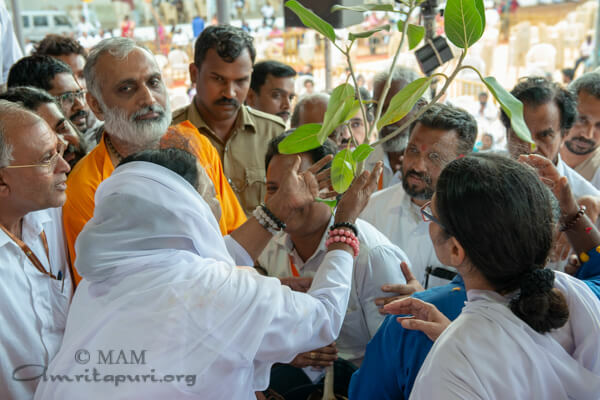 At the end of darshan, the school authorities brought a banyan tree sapling to be blessed by Amma which will be planted in memory of her visit. 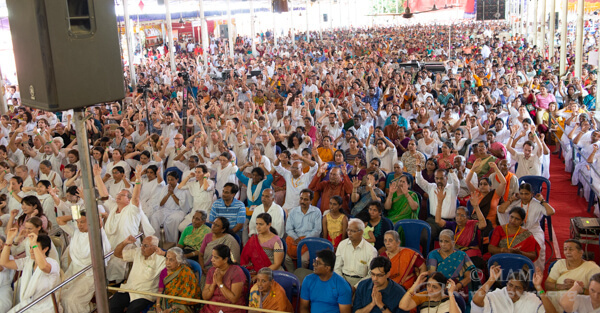 Darshan continued till 8.20 am the next day morning. 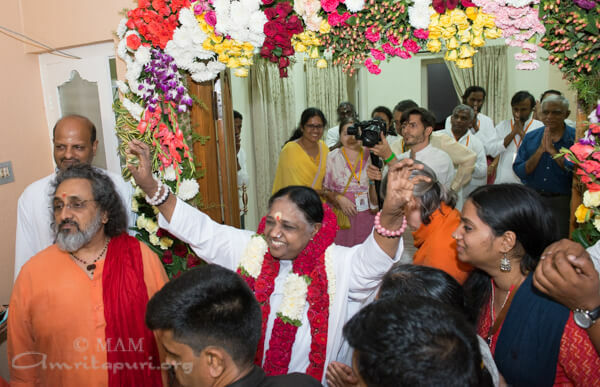 Amma reached Chennai at 11.37 pm. 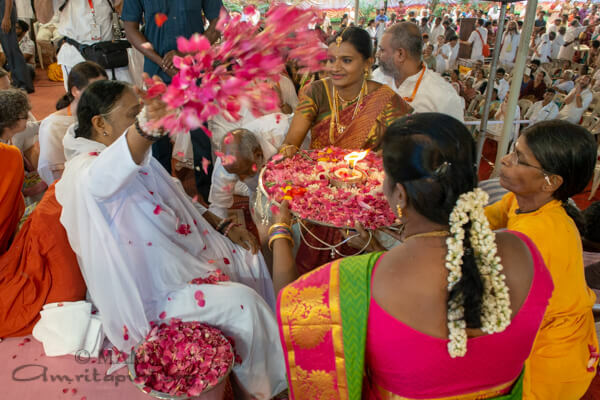 Devotees had been waiting for Amma’s arrival with their mantra on their lips and with love in their hearts. 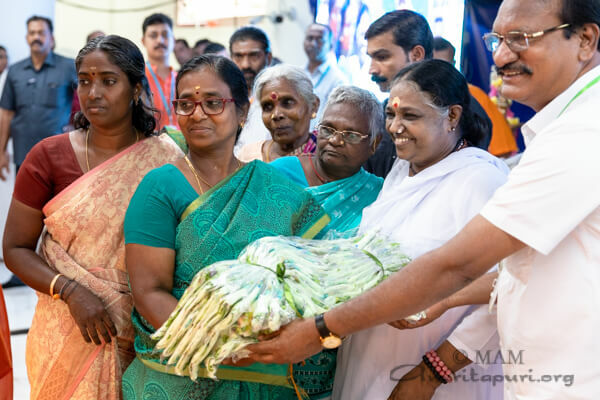 Dr V Maitreyan, MP; Tarun Kumar, Regional Office, CBSE Bangalore; KC Karupannan, Minister for Environment; Sevvoor S Ramachandran, Hindu Religious & Charitable Endowment Minister; were among the prominent people who garlanded Amma upon her arrival on the stage. 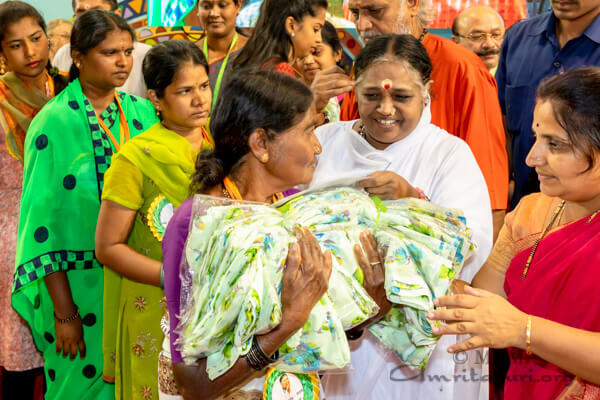 As part of the opening ceremonies, Amma gave saris to AmritaSREE self-help group members and also gave special prizes to Matruvani campaigners. 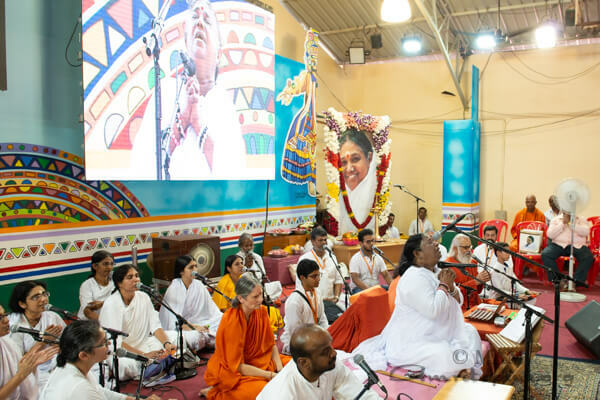 While Amma was giving darshan, many prominent musicians played for Amma, including Kumari Kanyakumari on violin and AS Ram on Keytar. 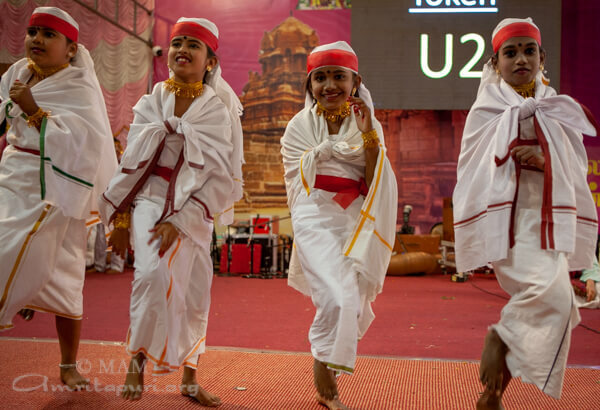 Cultural programs by the students of Amrita Vidyalayam and Amrita Balakendra members also entertained Amma and the gathered crowd. 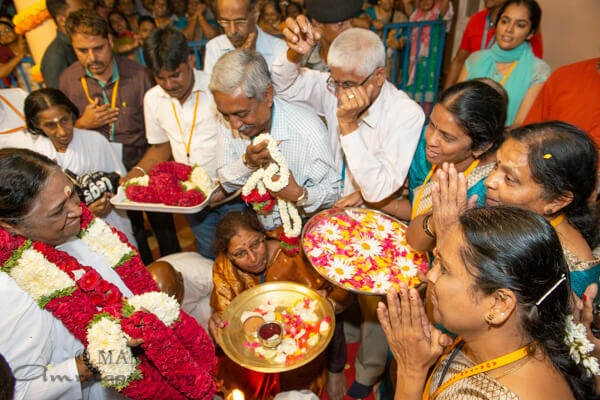 Devotees continued to come for Amma’s darshan throughout the night. 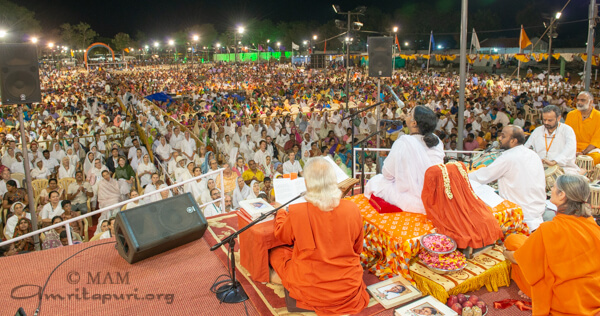 The second day’s darshan finished at 2.57 am.